No matter how well you speak Castellano or tolerate the blazing summer sun, Murcianos of southeastern Spain can always tell you’re not a local by how you eat a paparajote. You might be tempted by the treat’s sugary, crispy exterior, but if you rush ahead and take a bite straight through, you’re in for a bitter surprise. That’s because the crucial ingredient in this traditional treat is the leaf of a lemon tree. Nestled inside, the leaf gives the paparajote its shape and slight citrus tang. But the leaf is meant to merely lend a hint of flavor to the fried batter—not to be consumed. It makes sense that the paparajote has become a symbol of regional pride for Murcia. The city, located on the banks of the Rio Segura, is surrounded for miles by fields of plump citrus fruit. The fertile soil and almost year-round blue skies make the area (also known as “Europe’s Orchard”) an agricultural hotspot. It is important to choose the perfect leaves from the local huertas (orchards). Ideal candidates should be a healthy shade of light green, and neither too soft nor too hard to the touch. After that, it’s a matter of making a batter (typically consisting of milk, eggs, flour, and a bit of yeast), coating your chosen leaf, frying it in olive oil, then dusting with sugar and cinnamon. You can also find lemon zest and a little anise in some versions. Whatever ingredients are used, you can be fairly sure they’ll be local. It just wouldn’t be a paparajote if it wasn’t Murciano. The ritual of eating paparajotes is simple, yet still seems to confound visitors to the point that it has become a cultural test. If you want to pass with flying colors, just follow these simple instructions: Pick the leaf up by its stem and pull the batter off. That’s it. Peeling the delicious sugary skin off the leaf in one smooth go is one of the greatest pleasures of Murcian gastronomy. 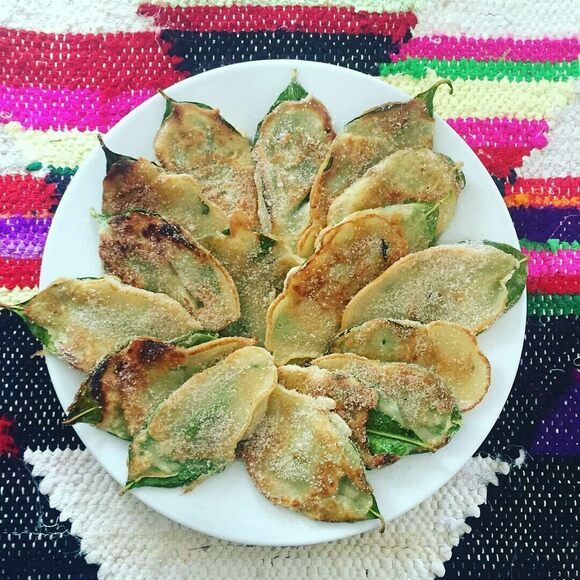 Paparajotes are available only within Murcia, typically during the spring. You can find them at fairs and fiestas, particularly during festivals such as Bando de la Huerta. Be sure not to get paparajotes mixed up with papajotes, a fried dough ball from the Andalusian city of Jaén. You won’t find genuine Murciano lemon leaves in those! Many visitors count this restaurant's paparajotes among their favorites. Their take on paparajotes includes chocolate.